The action is very fast-paced and I'd definitely try this on Harry Potter or Percy Jackson fans who just can't get enough magic. I love that Erica Kirov wove strands of Russian culture and history into the story. That definitely makes it stand out. But to be honest the book didn't completely grab me. I'll be the first to admit that I've got a lot on my mind at the moment with the start of the Summer Reading Club and all that goes with it. It's very possible that it's just my state of mind that's keeping me from getting hooked. One more thing... 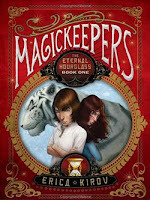 I've heard several compliments on the cover of Magickeepers: The Eternal Hourglass, but whenever I look at it I can't help but think of the cover of Larklight. What do you think? Am I stretching? *And yes, I was supposed to post on May 28, but a ridiculously slow FedEx delivery nipped that in the bud... Apologies for the delay! I'm eager to try this out on the Percy Jackson fans now that the series has ended. 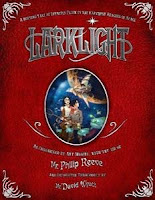 I see the Larklight cover too and a little bit of The Magic Thief too. I'm sorry that you didn't enjoy this one all that much. I really loved it. Of course I was completely in the mood for this type of story and genre, so that makes a huge different for me - the moody reader, lol! GreenBeanTeenQueen, I was totally going to compare it to The Magic Thief. Especially the 2nd one, Lost, because it is also red.